There's a story about a family that talked the Mother into getting a pet hamster. They promised that they would take good care of the little creature. She broke the sad news to the children. They took it quite well; but they did offer a few comments. One of the children said, "He's been around here a long time – we're sure gonna miss him." Mom agreed, saying, "Yes, I know, but he's just too much work for one person, and since I'm that one person that has to give him most of the attention, I say he goes." Another child remarked, "Well, maybe if he wouldn't eat so much and wouldn't be so messy around the house, we could keep him." But Mom was firm and insisted, "It's time to take Danny to his new home. Go and get his cage." With one voice and in a tearful outrage the children shouted, "Danny? We thought you said, 'Daddy!'" That's similar to the little boy who defined Father's Day like this: "Father's Day is just like Mother's Day, only you don't spend as much on a present." Another child once put it this way: "Mommy, if the stork is supposed to bring babies, if Santa Claus brings gifts, if the Lord gives us our daily bread and Uncle Sam our Social Security, why do we even keep Daddy around?" Kidding aside, unfortunately, we are living in a time that grossly underestimates the importance of fatherhood. Dad isn't someone who is optional to the family. His role is absolutely essential. What is more, fatherhood is foundational to a healthy and thriving culture. According to the National Center for Fatherlessness, almost every social ill faced by our nation's children is related to fatherlessness. Still, there is one other role of being a father that's not been mentioned and happens to be the most important – the responsibility of fathers to be the spiritual leader in the home. In the book of Acts there is a story about the apostle Paul and his companion Silas being persecuted, beaten, and unjustly jailed for their faith. They were singing hymns and praying in their bonds when God sent an earthquake to deliver them. When their jailer saw the power of God, he asked them, "Sirs, what must I do to be saved." They answered, "Believe on the Lord Jesus Christ, and thou shalt be saved, and thy house." By the phrase, "and thy house," Paul and Silas were not saying that if the jailer would believe, then all his family members would automatically be saved too. 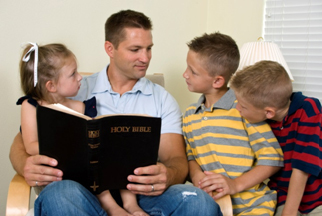 What the text does imply, however, is that when the father believes and takes his rightful place as spiritual leader in the home, when he exemplifies a genuine and dynamic faith in his own life, generally speaking, the family will follow his direction. The point is not to associate salvation with church attendance, but only to say that the father's spiritual influence, characteristically, is the most potent. Why? It's because in our most formative years, we tend to base our first concept of authority, on who God is, and what he requires, in what we see in our earthly fathers. Again, Dad's role is not optional to the family, its essential! It should never be underestimated. In fact, we could legitimately conclude that if fathers would be fathers, it would be all the activism necessary to turn this country around. ,,,,, "National Center for Fathering." National Center for Fathering The Consequences of Fatherlessness Comments. N.p., n.d. Web. 19 June 2015. "Fatherhood: The Underestimated Influence in Your Baby's Life." Mommypage RSS. N.p., n.d. Web. 19 June 2015.